WARNING: This is a preview of I Am The Fourth Wall. All components and rules are prototype and subject to change. Humanity has grown complacent, believing themselves to be safe in their 1950s suburbia lives. But a few have sensed something amiss in the world, and in their investigations have found like-minded individuals who have sought the truth. Their search into the void has warped their minds, but it has also gifted them supernatural abilities. Now, they have sensed what lies beyond the veil. And its eyes are beginning to open. 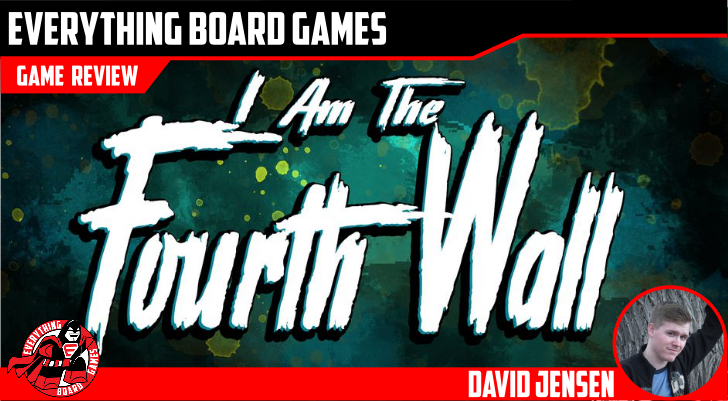 I Am The Fourth Wall is a card game of investigation, insanity, and cataclysmic consequences. In its varying game modes, players team up to defend their world from unholy terrors of H.P. Lovecraft's design. These foes can be purely controlled by the greedy desires of fate, or taken over by another rival player to destroy humanity in their chosen way. Stick together, close the gates, and don't lose your marbles... for something stirs from beyond the void. The box holds all the components easily and is small enough not to crowd your shelves. 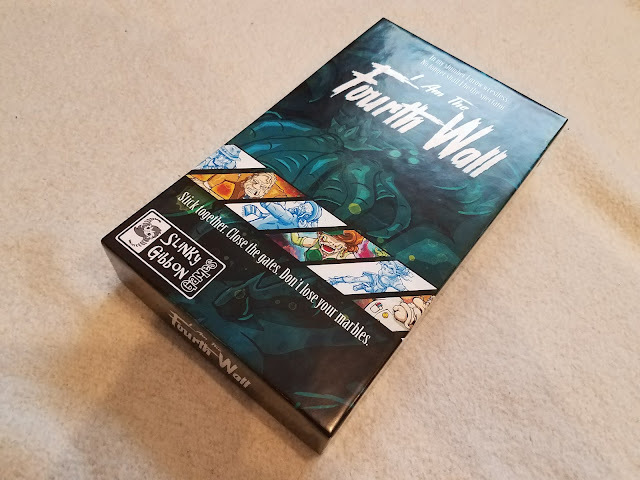 I Am The Fourth Wall is unique in that it contains three separate rulebooks: one for the Investigators, one for the player controlling the Wall (the entity beyond the rift), and one that details how to run the Wall as an AI. However, the basic rules are the same. On their turn, Investigators have two action points (AP) to perform actions, such as collect Marbles (items that both assist them in their quest and tether them to reality), close a Gate to slow the enemy, or use their unique action that they've gained from their delving into the rift. Meanwhile, the Wall takes a turn before each Investigator's turn, using Doom tokens either gained on their own or by actions of the Investigators; the Wall can either have a "Wrath" turn, where the Wall is on the offensive, or a "Brood" turn, stockpiling resources and forcing Investigators to focus on the horrors spawned by the Wall. (If the Wall is run by the AI, it has its own rules; it draws from a Presence deck to determine its actions and uses a token to predictably determine which Investigator it will target. 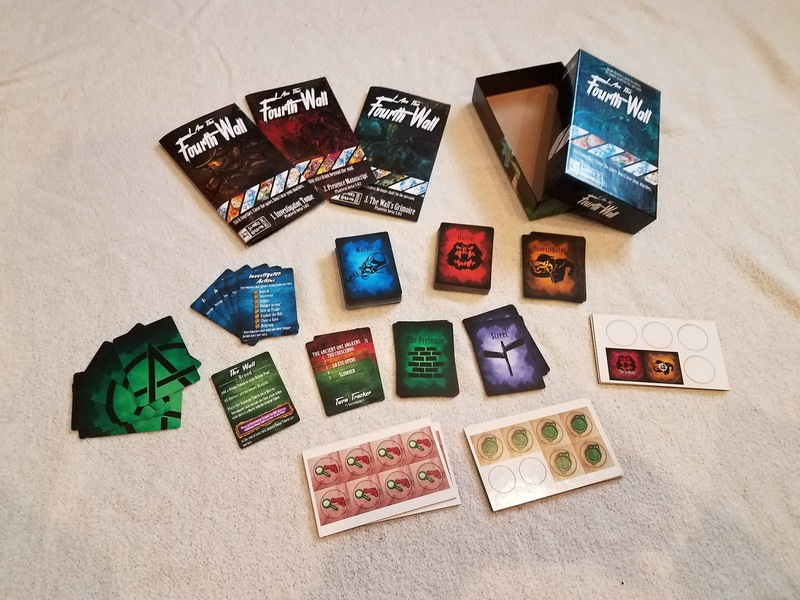 Through this simple back-and-forth exchange of cards and action points, there is a turn tracker that marks the Wall's progress from slumber to its awakening. Each time the turn tracker enters a new phase, the Wall gains new abilities until it finally awakens. The Wall is also attempting to open Gates, which will allow it to enter the world. If the Wall has all five Gates open and is no longer in the "Slumber" phase, or if it keeps enough Gates open to make it to the final phase, "The Ancient One Awakens," it breaks through the veil and plunges the world into madness. However, if the Investigators can close all the Gates before the Wall awakens, it is sealed off from our world forever. 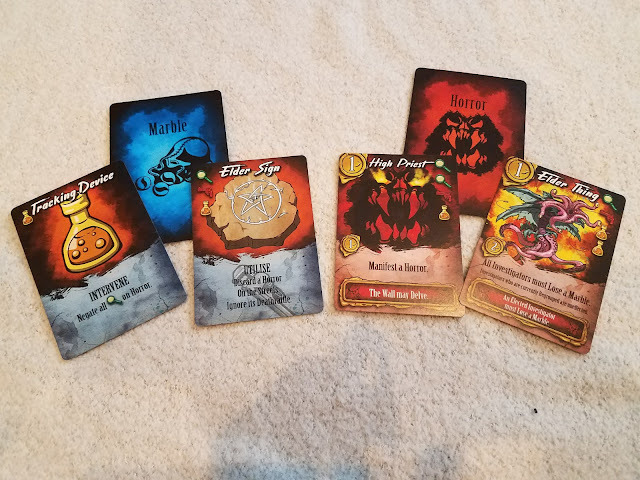 Three separate rulebooks, nine types of cards, and four unique token types. Gotta love that new game smell! To start setup, the Investigators separate and shuffle the Marble and Investigator cards. 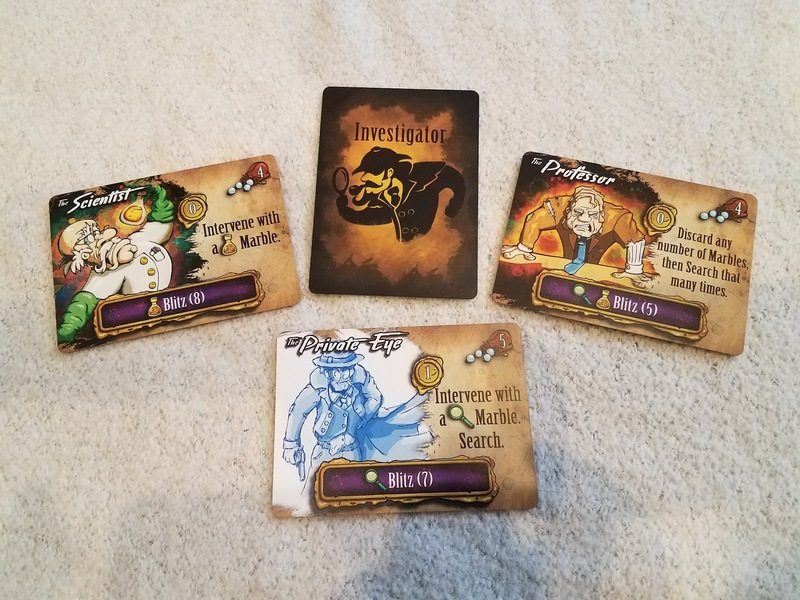 Each Investigator takes a reference card and draws two Investigator cards, choosing which of the two they wish to use and returning the other card to the deck (if there are only one or two Investigator players, it's highly recommended that they each have multiple Investigators under their control). Investigators also draw a number of Marble cards equal to their Sanity (listed on their card). The Wall, meanwhile, shuffles the Horror and Wall decks. They also pull out their reference card, the turn tracker cards, the Enhancement tokens, Doom tokens, and the Scourge token. 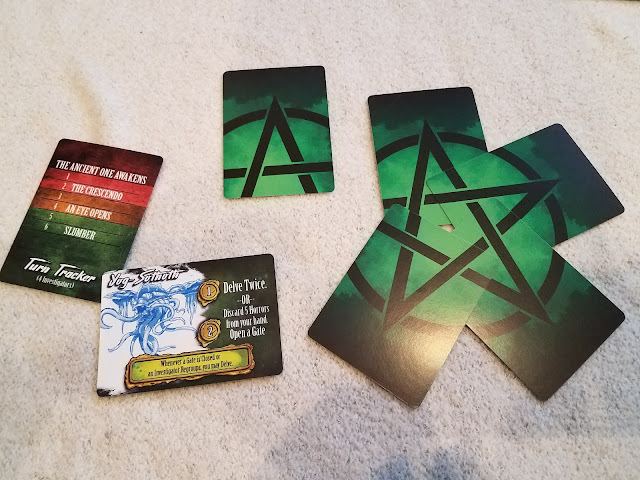 Select the relevant turn tracker card depending on how many Investigators there are, then draw a Wall card; this will be your character. Place the Wall card face down on the turn tracker so only the "Slumber" phase is visible. Three of the remaining Wall cards are then placed face down in a half-pentagram shape to represent open Gates. The Wall draws five Horror cards for their starting hand. When the Wall is an AI, there are a few changes to its setup. 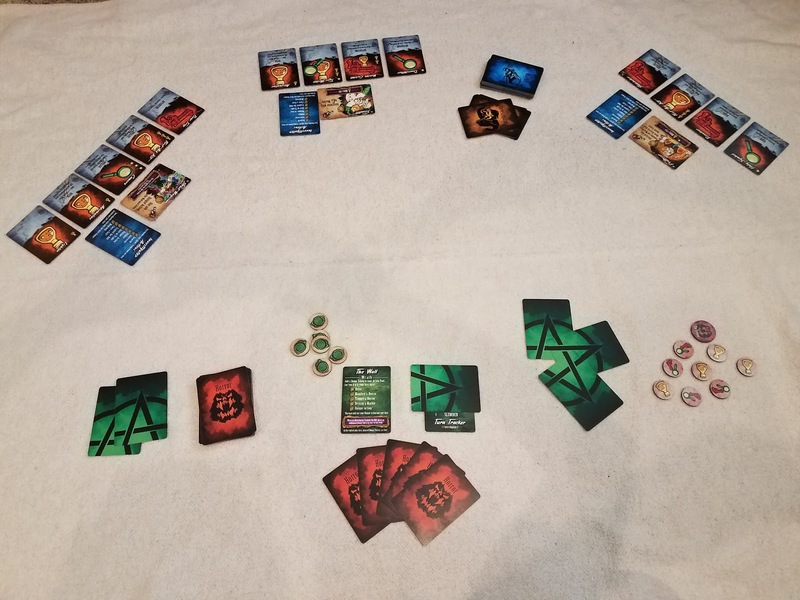 Instead of its actions being chosen by a player, they're chosen by a draw from the Presence deck, and the Scourge token is replaced by the Target token. 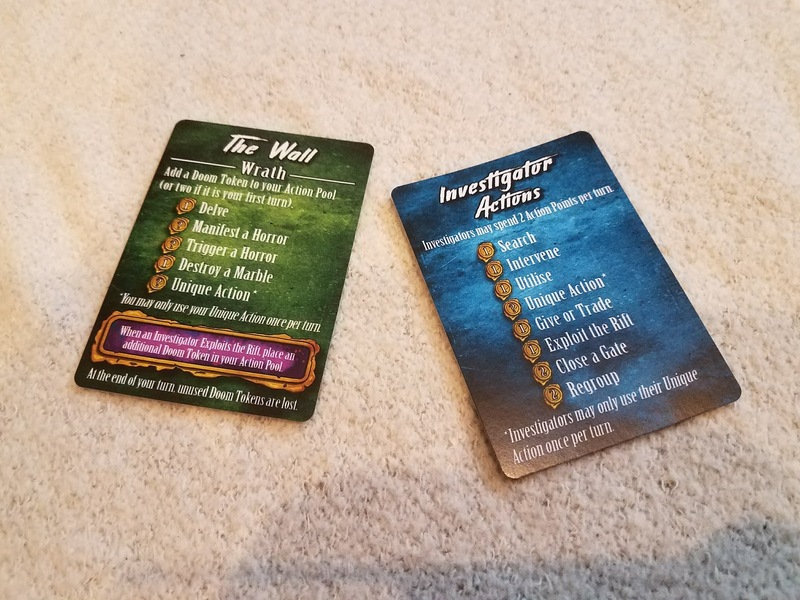 The Street cards are also used with the AI, giving benefits to both the Wall and Investigators. While I Am The Fourth Wall may not be the first Lovecraft-inspired game, it is no doubt a strong contender within the genre. The variety of Wall enemies range from the name everyone knows, Cthulhu, to entities like Hastur and Nyarlathotep that the uninitiated may not recognize. Each Investigator embodies a stereotypical character, like the Professor, Private Eye, or Archaeologist. The card phrasing, the simultaneously cooperative and competitive action, and concept of "losing your marbles" by making them items you use to combat the horrors, all of it lends itself to the theme. Note each Investigator's unique abilities that set them apart from one another. They're more than just pretty faces, after all. The basic action point mechanic is one veterans will likely recognize, and it's very easy to grasp for new players, as well. The Doom tokens used by the Wall essentially function as action points, the only difference being that the Wall can collect extra to use over time. The turn tracker also adds a level of urgency to the Investigators, as the later rounds will give the Wall more power and bring them closer to annihilation. There's also a blend of randomness in the drawn cards and strategy in players having to effectively use their action points and keep track of the turn tracker, Gates, and their Marbles (if an Investigator loses their final Marble, they are driven insane; another Gate opens, and they must draw a new Investigator card). When controlled by an AI, the Wall has two new decks of cards to torture the players with. Cooperation is key in this game, and Investigators are encouraged to openly discuss strategies, cards, and abilities. However, it's one thing when the Wall is run by the AI; if a player is in control, then such open dialogue can easily be overheard by them, and they are just as welcome to use that information to their advantage. 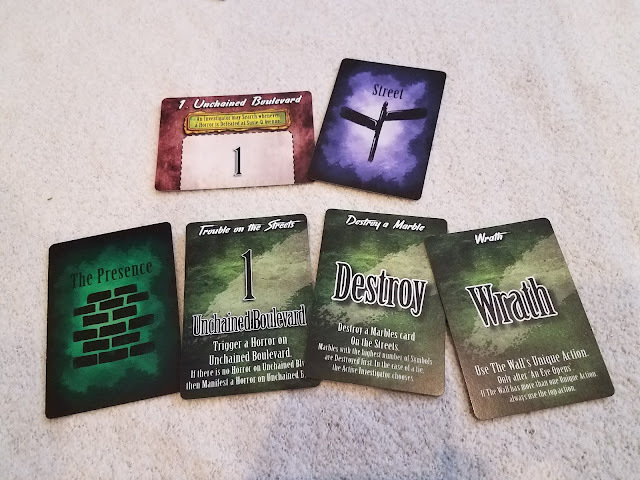 The competitive nature of the game reminded me of Betrayal at House on the Hill, especially considering the fact that both the good guys and bad guy get their own set of rules (and that's not even touching on the horror elements). Even when games ran long, they felt like they went by quickly. That's the hallmark of a good game: time flies when you're having fun. Reference cards. Easy to make, hard to make well. Perhaps one of my favorite parts of the game was the turn tracker. Not only does it serve as a great mechanic, but a very simple tweak makes each game run smoothly. There are technically four turn trackers, and the one you use varies depending on how many players there are, offsetting the number of players with the number of rounds. This means that whether the game had a solo Investigator or six working together, each game worked out to have 48-50 total turns taken (including those of the Wall). Small games didn't end too quickly, larger ones didn't drag on, and most importantly, it felt like it played very well no matter how many players there were. If Yog-Sothoth opens the fifth Gate and completes the pentagram, our world as we know it is over! While not all of the artwork was finished in my prototype copy, what was can only be described as a perfect blend of Lovecraftian horror and cartoonish stereotypes. The colors are bold and striking, the weathered and crazed looks of the Investigators make it clear they've got quite the fight on their hands, and the abominations they face look downright disturbing (though still cartoonish enough to not give younger players nightmares). It's gorgeous in a terrifying way, and I kind of love it. Some example Marbles and Horrors, the tools of the trade for Investigators and the Wall. I Am The Fourth Wall keeps its components simple. There are a total of 130 cards and 16 tokens. The cards are from good stock, the lettering and iconography is easy to read and reference, and each card type has a unique back design to make separating and shuffling a breeze. The tokens are solid, as well, and easily identifiable from one another. The rulebooks do a good job of explaining the rules for each group, though there are some rules that are a bit confusing in where they're placed within the books. Overall, everything meshes well together, with the cards and tokens complementing each other in both design and function. 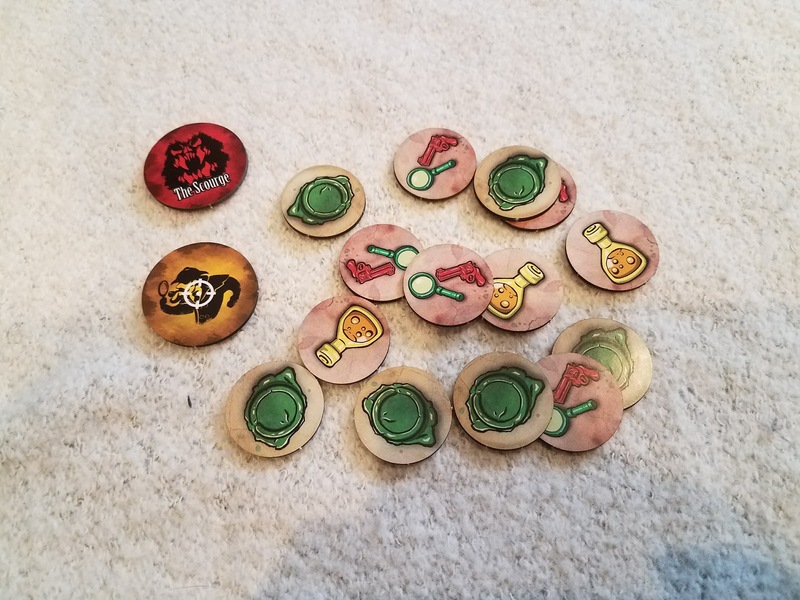 Sorry, Investigators - these tokens are for use by the Wall only. Simply put, this game is beautifully designed, its mechanics are simple while still allowing for high levels of strategy, and the tension that builds as you get into the final rounds is palpable. 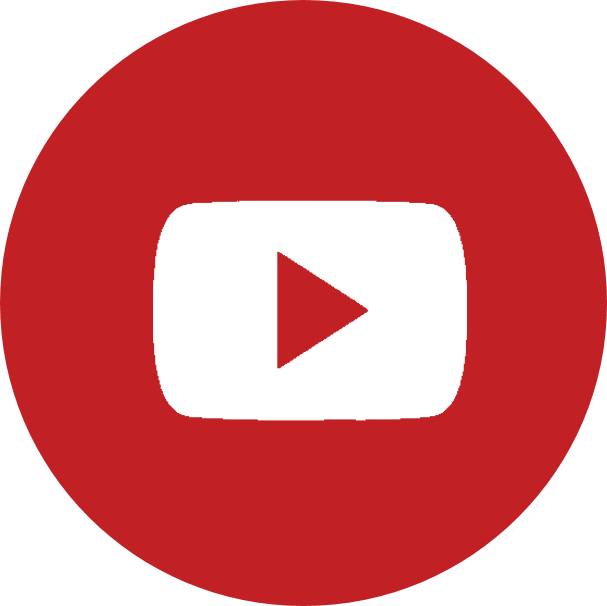 Best of all, it can be played whether you've got the whole family over, or if you're just looking for something to keep yourself occupied; it can be played purely cooperatively, competitively, or as a combination of the two. It's rare to find a game that's both flexible and deep, but Slinky Gibbon Games found a way. My only real criticisms lie with parts that may very well be due to the game's status as a prototype. In truth, it's hard to find anything worth complaining about. Those sick of Lovecraft may not enjoy it, and players who prefer high-quality miniatures may be turned away, but the game stands tall as an excellent entry into the medium. Fans of Lovecraftian horror, or those who enjoy the all-versus-one gameplay of games like Betrayal at House on the Hill, will love the chaotic back-and-forth challenge of I Am The Fourth Wall. Those looking for a fun and flexible card game should also seriously consider giving it a look. Just be careful... something may look back.